HOUSTON, Oct. 27 (Xinhua) -- China and the United States should work together to ensure the sustained and healthy development of bilateral relations, Chinese Consul General in Houston Li Qiangmin said Friday night. 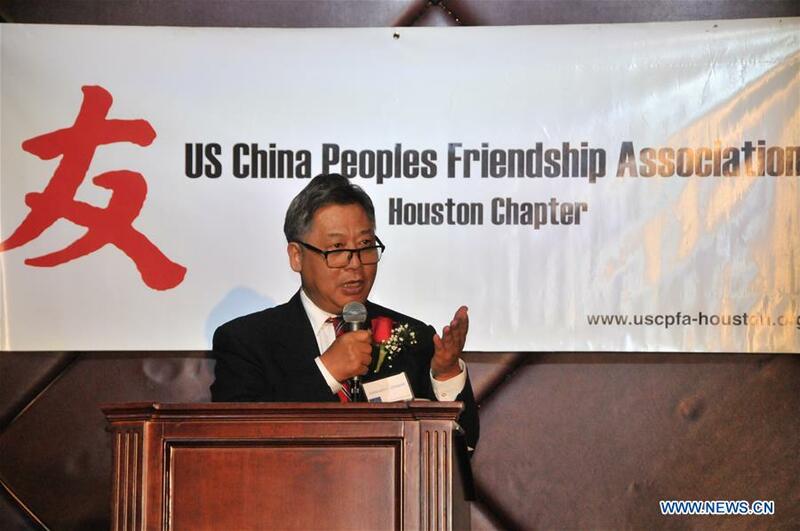 Delivering a speech at the 12th annual friendship ambassador award gala by the U.S.-China Peoples Friendship Association (USCPFA) Houston Chapter, Li said the sound and steady development of China-U.S. relations serves the fundamental interest of the two peoples and meets the expectation of the international community. Next year marks the 40th anniversary of the establishment of China-U.S. diplomatic relations. Looking back into history, Li said the normalization of bilateral relationship made China integrate into the international community and China's development also delivered tangible benefits to the United States. Referring to the recent trade disputes between the two countries, Li said, "It is natural for China and the U.S. to have differences. The key is how we should address them." He emphasized that the two sides should build a relationship featuring "non-conflict, non-confrontation, mutual respect and win-win cooperation." This year's friendship ambassador award was presented to Ed Gonzalez, the Harris county sheriff in Texas. Founded in 1974, the USCPFA is a non-profit educational organization with the goal of developing and strengthening friendship and understanding between the peoples of the United States and China.